When playing Arcane, you need to buy materials to build damaging towers. In this guide the materialcosts (30g each) are already included. Eg 5g for a Firetower + 30g for the Fire-Orb is shown as 35g. You can use your second Hero- the kid to buy them. that you could help the other side very much using skills or even towers. He is able to never leak the whole game easily. 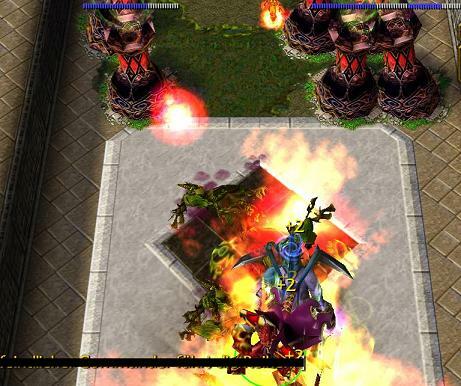 Arcane is able to heal all players on the map using only 4 healingtowers in combination with manatowers! Still you shouldn't kill the other sides mobs if they're not leaking, because its bad of you. Add all your Firetowers on 1 Hotkey using CTRL+(Number) to use their skills! 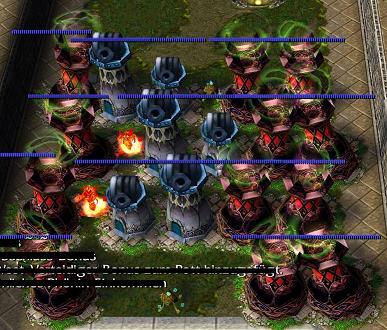 Also each line of Lightningtowers needs one Hotkey. in this wave mana is short, so the mana can regenerate a little. -If you've been unlucky in the first minigame you either have to build small firetowers instead and upgrade later. If you want to do that you have to do it before the mobs are incoming. Kill the first 4 ones with Speedup-Skill and directly upgrade your tower. Look at the picture of wave 14 to know where to place them. the tooltip saying everyone gets that is wrong. Also think of it, that this tower tower can be sold for 15 gold, which means it is still useful until wave 30. But then you have to think of it, that if you use it in your maze you cant sell it. 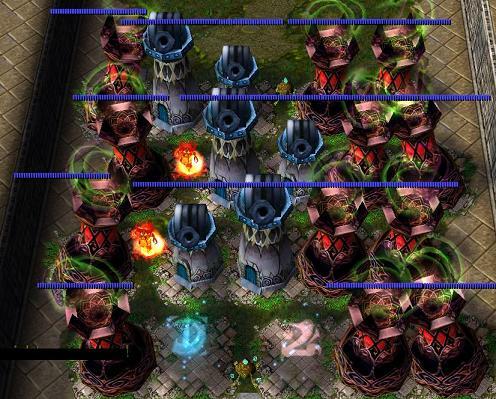 Look at wave 14's pic to see how to place your towers! you should use Firetower-Speedup again. 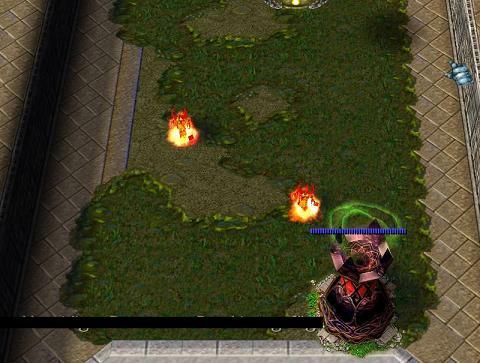 Stand infront of your maze and when the boss is nearby in infront of you, then use the Fire-Stun-Skill! If you don't, he will be immune and just run away. If you still didn't get him you need to buy Lightning-materials and use your Lightningskill. Each Material should decrease his life by about 25%. -build one slowingtower (35g) at front and !leave the 2 big spaces around it for later (Scarlet-Slow)! also, if you already got enough money, you should start the next step in your maze to fill it with 50% improved, 50% unimproved frosttowers (30g -> +90g). -Activate Speedup when mobs are in range. -Stun flying bonus infront of your maze when they're too close. Kill 10 mobs on the other side if youre good enough using Lightning-Spell. if you're not good enough use it on your side (that is if you did'nt get all firetowers). If you already got frosttowers you can also use your frostspell on frost-slowed mobs. -build one slowingtower (35g) at the back of your maze. 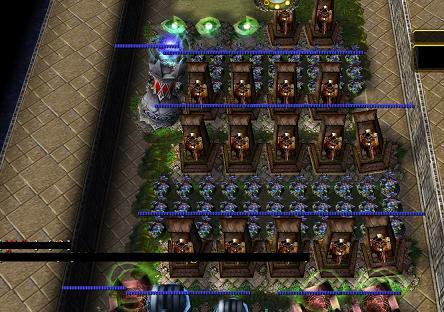 Fill your free spaces except the front line with frosttowers (30g each). If you got enough money, improve one each line (90g each), if your never upgrade them. -Build one lightningtower (45g) and improve it (100g). Look at the picture of wave 18 to know where to place it. and improve the one more nearby to the center (90g). -Use Manabomb-Skill infront of your maze to slow and kill Air-Bonus! you can use your other spells to kill mobs on the other side again, because they leak some most often anyway. 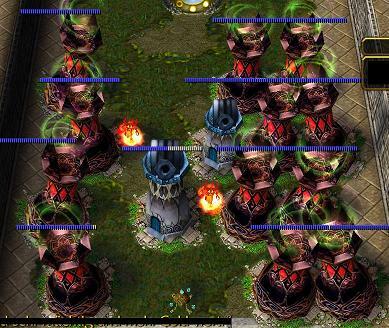 -Build healing towers (140g) once you need them at the back lines. 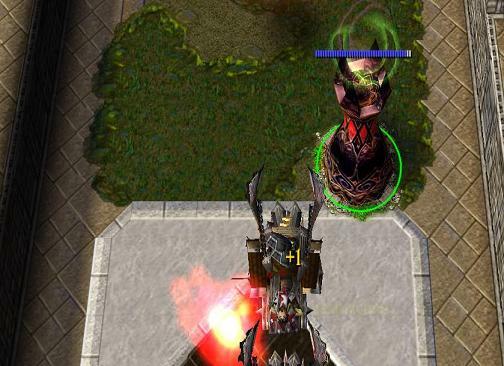 Build up to 4 lines of Big Lightning-Towers (360g) / Healing-Towers. 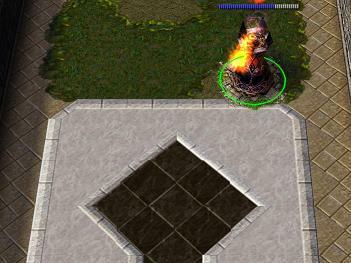 When building the first ones, try to build the right amount of manatowers at the best placement you can do to reach most of the damagetowers. -Use all spells whenever you need them or help out others when leaking and also get more Skibis Castle TD builders to have more skills. Use your kid at start to give your lightningtowers mana with the Arcane-Skill. 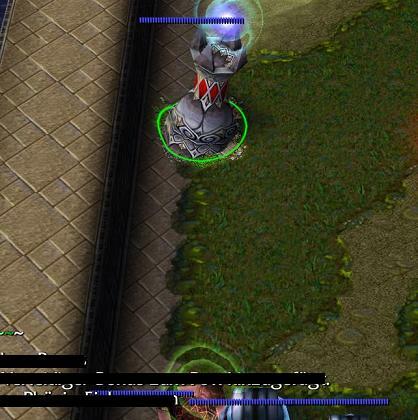 Whenever possible, stand in the center of your lightningtowers with your aura to give them a little more mana.